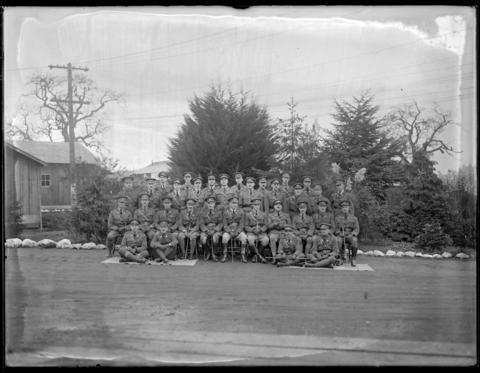 Photograph depicts the officers of the 259th Infantry Battalion. Many officers In the front row have overseas service chevrons and/or wound stripes on their uniforms, meaning they had seen action in Europe. The 259th was raised as part of the Siberian Expeditionary Force. They all wear the unique cap badge for their battalion. Glass plate has been taped by the photographer for processing. Restriction: image J-01860 is a glass plate negative. Researchers should consult the online reference image prior to consulting the original.